The thirty-second year of the Seattle Art Museum’s annual Film Noir Cycle, “the granddaddy of the world’s film noir festivals,” opens with one of the most unheralded masterpieces of shadowy American melodrama: The Reckless Moment (1949), directed by continental stylist Max Ophuls (shortened to “Opuls” for his American screen credits). Known for his visual taste and elegance, his ravishing style and his delicate portraits of impassioned, impossible love in a world of fickle lovers and social barriers, the Austrian director came to America (like so many European artists and intellectuals) in the early years of World War II and (again, like so many fellow film artists) struggled to find his place in the Hollywood system. He only directed five films in his ten years in America (one of which he was fired from before completing). The Reckless Moment was his last before returning to Europe. Set in post-war suburbia, in a seaside bedroom community outside of Los Angeles, The Reckless Moment is a mix of crime drama and what Hollywood once called a “women’s picture,” a label they applied to almost any film that took a woman’s perspective. 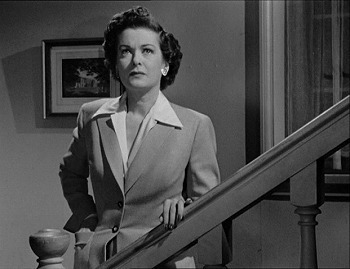 One-time ingénue Joan Bennett makes a confident transition to the role of Lucia Harper, a wife and mother holding her family together (two teenage children and a retired father-in-law) while her husband is working overseas. She’s a modest woman but a defiantly protective mother who doesn’t flinch when confronting the oily gigolo who has seduced her increasingly assertive and independent minded daughter, Bea (Geraldine Brooks), and puts herself in harm’s way to cover up the man’s death and a potential scandal. 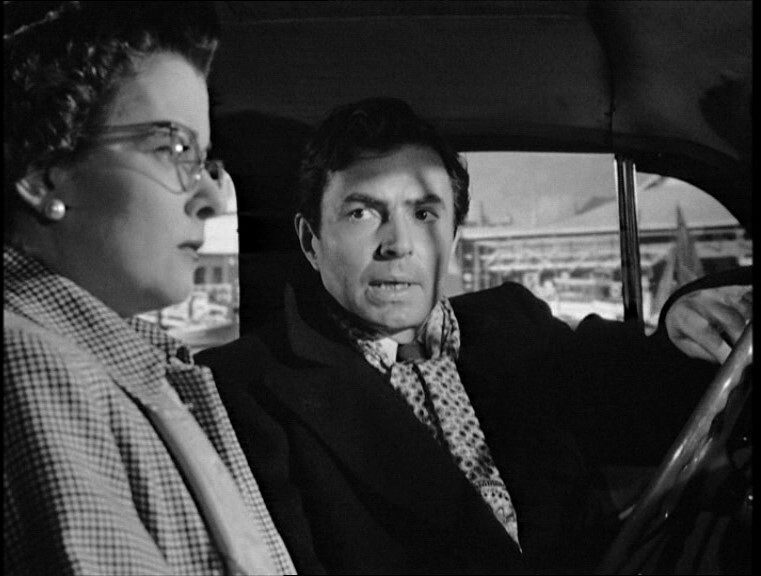 When that only brings on blackmailer Martin Donnelly (James Mason), a darkly attractive and quietly menacing Irish thug who demands thousands of dollars for incriminating love letters, she discovers that she is essentially powerless in this society to secure a loan or to get money without a husband at her side. Ophuls shot the film on an obviously small budget (Bennett’s star had faded and it was only Mason’s third American film) for Columbia, which specialized in the budget-minded first run picture. The film is rife with strains of “goony” dialogue, unnatural exclamations, one-sided phone conversations whipped through at a sprint and other conventions of studio pictures. Ophuls masterfully shapes it all into a portrait not just of suburban middle class security shaken into chaos when it collides with big city corruption, but of the social prison of middle class family. Ophuls’ camera moves with his usual grace, tracking and panning and tilting with the action, but this isn’t the elegant dance of his European films, waltzing through the rituals and facades of high society. He’s after the busy-ness and bustle of American life: the flutter of kids in the house, the pockets of low-lifes hanging out in the dinghy hotel lobbies and bars, the throngs on the street. We may catch a little of these lives in passing before moving on, as if they all have stories themselves, but never pause to consider them, for the camera is completely wedded to Lucia and her movement in both private and public. Even in crowds he isolates Lucia from the throngs, more alone than ever even surrounded by her neighbors. Ophuls also knows when to still the camera, especially as Lucia finds herself increasingly constrained and trapped by her surroundings. When she goes for a loan, the office becomes a veritable cell, and Ophuls constantly frames her behind railings, like prison bars. Through it all, but for a few key scenes, we are essentially locked into Lucia’s experience. Bennett’s performance is layered with masks and fronts that she puts on for her various social and familial responsibilities. She’s determined not to let anyone know the pressure she is under, and thus only Donnelly notices. Except for one scene with her daughter, Bea. When Lucia talks on the phone to her husband for the first time after the fight with Bea, she lets neither word of their fight nor the anxiety of the situation into the call and she exchanges a glance with Bea to let her know that she won’t. Bea looks back with a similar glance and Lucia lets the slightest of smiles out: mother and daughter in solidarity even while arguing. There’s also a kind of love story here, as Donnelly becomes aware of Lucia’s resolve to protect her family at all costs, and like his great European romantic dramas, it is less about unconditional, emotionally pure, idealized romantic love than the attraction and respect and the need for emotional support that in certain situations may become mistaken for love, and becomes elevated to an idealized force in the face of forces that keep these people apart. Ophuls’ ultimate expression of this is The Earrings of Madame deâ€¦ (1953), where the idealized romance between the married Countess of the title and the suave Italian diplomat is presented with cool, graceful restraint. It’s the model of continental ambivalence, but the Countess is less overwhelmed by passion than enthralled by the idea of love: it’s only in the absence of her attentive lover that her perfect comportment collapses, and she throws away all of the rules of her game not for love so much as the fear of facing a life that has been so empty and is about to be so again. Are Lucia, the upper-middle class matron who has become mother hen and protective father to her family, and Martin Donelly, the working class street thug who affects class but is really a lowly criminal, really in love? Or is he attracted to her because of her class, the way she cares for her family, the obvious sacrifices she makes for those she loves (something alien to but much desired by Martin)? And does she fall for this sinister intruder turned dark angel or for his sacrifice and his very presence as a caring male figure of power and authority, a stand in for the husband that has left her (unknowingly) to the mercy of a noir nightmare? It makes the relationship no less poignant and in fact it sheds a new yet just as compassionate light on the idealized romances seen in the movies. These people are no star-crossed storybook lovers, but thoughtful, driven, feeling people caught up in the tangle of dilemmas and threats, thrown together by chance but given the opportunity to provide emotional help by their very presence. They are drawn together not by desire so much as desperation, need, desire, companionship, respect and, for Donnelly, a chance at redemption. In the dark days of this outwardly sunny life, as the world closes in on them, this may be the kind of love that sustains and saves us. It certainly makes for the purest and most impossible love of Ophuls’ films, and for me, the most emotionally compelling. The Reckless Moment plays Thursday, October 1 at Plestcheeff Auditorium at the Seattle Art Museum at 7:30 p.m. Series tickets are sold out but tickets to individual films may be available on a first-come, first-served basis.